Ingela Edwards Counseling, PLLC has relocated to 250 Adriatic Parkway in Adriatica’s new Shepard Building. Look for the building near the bell tower with the fancy looking “doghouse” on top (clerestory). 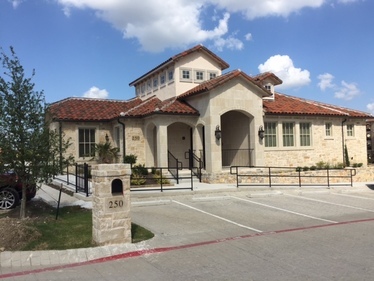 Adriatica is located off Virginia Parkway between Stonebridge Drive and Ridge road. It is approximately 4 miles West of 75 and 7 miles north of Highway 121 and Custer Road. Driving west on Virginia Parkway – take a left onto Adriatic Parkway. Pass Independent Bank on the right corner and turn right into the next lot. If you pass it up you will have to go down to the harbor. Driving east on Virginia Parkway – take a right onto Adriatic Parkway after passing through the light at Stonebridge Drive. Pass Independent Bank on the right corner and turn right into the next lot. From Starbucks – drive past Starbucks as if you were going to the drive through lane. Continue past the drive through lane across the service road into the Office Park lot. The JShepard Building will be on your left. Driving north on Stonebridge Drive – turn right on Mediterranean Drive, circle the harbor and turn left into the Office Park lot near the tower. We are moving into the building in advance of the other tenants so we appreciate your patience at the temporary inconveniences as we work to get it up to speed. Parking may be an issue at times, particularly on Saturdays. There is a multi-story parking structure just past Harry’s at the Harbor.